The new CS540 replaces the well-known CS55 headset system. The new Lightweight (21 grams) headset is an ergonomic solution that keeps your hands free for writing or keying while you're on a phone call. It provides hands-free roaming of up to 350 feet and up to 7 hours of talk time between charges. 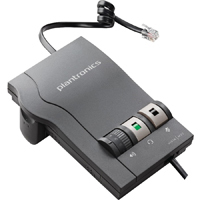 The HL10 Telephone Handset Lifter from Plantronics fits on your telephone, allowing you to answer any call with the touch of a button. It also conveniently and automatically takes your handset off the hook. The CS520 from Plantronics is part of the CS500 Series of wireless headset systems which offer superior clarity and secure digital encryption for both incoming and outgoing communications. The CS520 features a lightweight rechargeable "Binaural" reversible headset which supplies audio input to both ears. 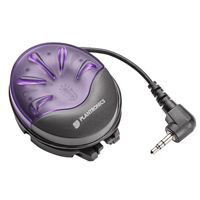 This makes it an excellent solution for users who may have limited hearing in one or both ears. Directing audio through both ears can also be of value in noisy environments or where adjacent communications may prove to be a distraction to conversations. The noise-cancelling microphone is on an adjustable extending boom for optimal placement. By eliminating the traditional "neck cramp" position the risk of users developing associated neck and shoulder issues is significantly reduced. 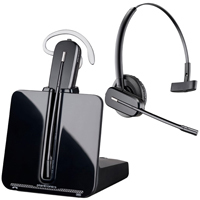 The wireless headset also frees the hands for writing or keying, and can provide hands-free roaming of up to 350', all of which can lead to improved productivity. 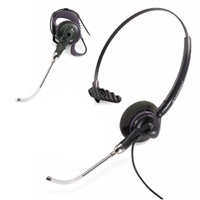 The included Handset Lifter enables a user to use the "Remote Answer" feature on the headset, providing them with the freedom to answer or end phone calls without the necessity of returning to their desk. The wireless headset can provide up to 9 hours of talk time between charges. Note that talk time will be reduced if operating in wideband mode (for higher quality sound) or if working at a significant distance from the base. A short 3-hour recharge time means that users need only be without their headset for short periods. The convenient charging base offers a perfect storage location, ensuring that the headset is always charged and ready for use. 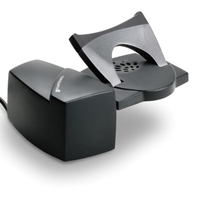 Although the CS520 is compatible with a wide range of common single and multi-line office telephones compatibility should be verified prior to purchasing. We can assist in that if you are able to provide the Make and Model Number of the phone to which this will be attached. 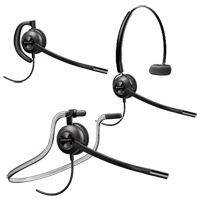 The EncorePro HW540 Headset from Plantronics offers users 3 different wearing styles, easily converting between over-the-ear, over-the-head, and behind-the-neck configurations. Incoming calls are crisp, with high-quality audio and the flexible noise-cancelling microphone ensures that callers receive clear filtered communication. The EncorePro headset is equipped with soft foam pads and features lightweight design for comfort throughout the day. 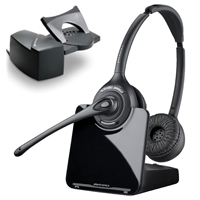 The EncorePro HW540 is an ideal replacement for the discontinued H141 Duoset Headset. 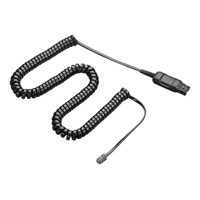 NOTE: The EncorePro HW540 headset requires a Plantronics Direct Connect Cord in order to connect to the headset jack on the phone. Please indicate the make and model of the phone the HW540 is to be used with in order to verify the compatibility of the HW540 headset. 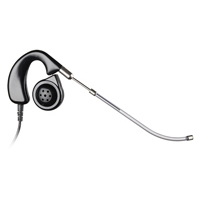 This headset is an ergonomic solution that keeps your hands free for writing or keying while you're on a phone call. It provides hands-free roaming of up to 300 feet and up to 8 hours of talk time between charges.